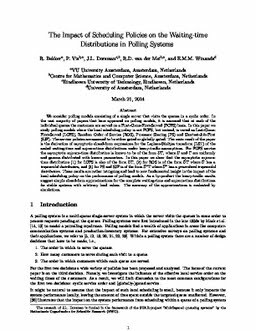 Centrum Wiskunde & Informatica: The impact of scheduling policies on the waiting-time distributions in polling systems. The impact of scheduling policies on the waiting-time distributions in polling systems. We consider polling models consisting of a single server that visits the queues in a cyclic order. In the vast majority of papers that have appeared on polling models, it is assumed that at each of the individual queues, the customers are served on a first-come-first-served (FCFS) basis. In this paper, we study polling models where the local scheduling policy is not FCFS but instead is varied as last-come-first-served (LCFS), random order of service (ROS), processor sharing (PS), and shortest-job-first (SJF). The service policies are assumed to be either gated or globally gated. The main result of the paper is the derivation of asymptotic closed-form expressions for the Laplace–Stieltjes transform of the scaled waiting-time and sojourn-time distributions under heavy-traffic assumptions. For FCFS service, the asymptotic sojourn-time distribution is known to be of the form UΓ, where U and Γ are uniformly and gamma distributed with known parameters. In this paper, we show that the asymptotic sojourn-time distribution (1) for LCFS is also of the form UΓ, (2) for ROS is of the form ˜UΓ, where ˜U has a trapezoidal distribution, and (3) for PS and SJF is of the form ˜U∗Γ, where ˜U∗ has a generalized trapezoidal distribution. These results are rather intriguing and lead to new fundamental insight into the impact of the local scheduling policy on the performance of polling models. As a by-product, the heavy-traffic results suggest simple closed-form approximations for the complete waiting-time and sojourn-time distributions for stable systems with arbitrary load values. The accuracy of the approximations is evaluated by simulations.